Mix sugar, ghee and water. Put to boil. Cook till sugar dissolves. Remove and keep aside till it becomes warm and not cool. Roll out this dough into ¼ inch thick chapatti. Cut into diamond shape. To fry the above shankerpara take oil heat to warm put the shankerpara in it and fry in warm oil till golden brown. Note do not let the oil become too hot or u will have soft shankarparas. Add all the masalas to flour. stir to mix. Rub in oil. Using enough water make dough-having a stiff consistency. Roll out the dough and cut into rounds of desired size. Heat oil to warm, fry the puris on slow flame till brown. Note do not fry the puris in hot oil or they will remain soft. Soak the black chana overnight. Mix sprouts with soaked channa along with its water. Add more water to make it total 5 cups. Either pressure cook for 2 whistles or microwave for 4 minutes. Strain out the water. This forms the stock of our soup. Boil the above stock along with lemon grass, green chili and ginger for 3 minutes. Cool and strain. Heat 1 tablespoon oil add bay corn saute till light brown specs appear on them. Add mushrooms, saute till water present in mushrooms dries up. Add carrots and saute for few seconds. Add the cooled and stained stock. Bring to a boil. Add lemon juice, salt and pepper powder. Mix. Mix corn flour in little water and add to above. bring to a boil. Adjust seasoning if required. Serve hot. Use the left over sprouts and black chana in a salad--- simply add some cut onions, tomatoes and cucumber. Toss with salt, lemon juice, pepper powder and serve. 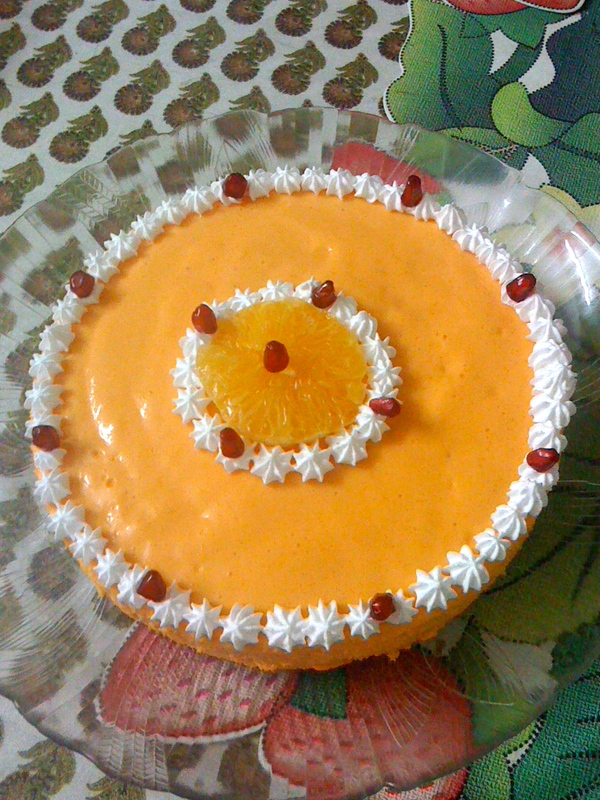 Kirti tried the Orange Desire and sent the pic. This is Megha Madhamshettiwar. I have attended ur mexican n snacks classes. In r society we had stalls for the ganapati funfare. I had kept tacos. U wld not believe it I made a sale of Rs 1400/- just in approx 90 mins. It was a total hit. I had people cmg an telling me time n again that it is just flawless. Just for some tangy taste I was topping it with homemade salsa. Everyone really freaked on it. So thanx a ton for teaching me this wonderfil dish. Cut open the avocado and scoop out the pulp from inside. Mash the pulp. Add chopped tomatoes, onions, garlic,salt and lime juice. Mix well. Serve chilled with corn chips. Mangla took part in a cookery competition werein she made the award winning entry of Katori chaat. On both sides of the buttered bread sprinkle some Cinnamon and powdered sugar. Toast to warm on a pan so that the butter melts and hols the sugar and Cinnamon onto the bread. Remove onto a cooling rack and cut into four. Pipe fresh cream onto the cut splices using the big star nozzle. Sprinkle chopped fresh fruits on top and serve immediately. It was great and yummy!I am a huge fan of coffee and chocolate.And tiramisu is like heaven for me.Now theirs no point in going to bakery to buy one when I can make it myself. 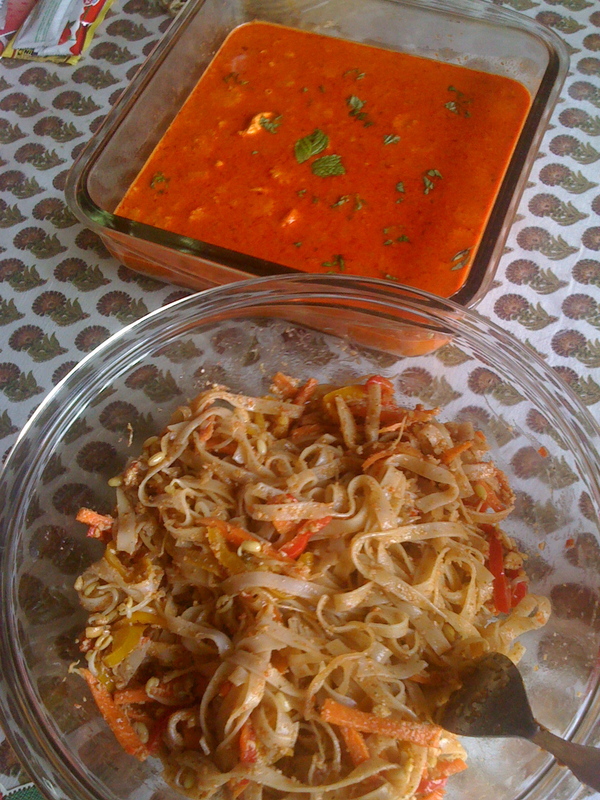 Hey my jiju became a great fan of your thai food now i have to teach him the Pad thai noodles and thai red cuury! Made this muffins today, they are plain muffins with tutti-fruti.I just loved to decorate the muffins and thanks to you as always "Let your imagination fly" I tried some of it. Will be trying some more next week. P.S:-As usual my hubby couldn't keep his hands of the muffins will be trying Thai food tomm. 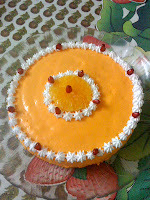 Hi have added recipes for cakes with eggs and without eggs too. Please do try them as am sure they will turn out great. Do follow the method illustrated in the class to be able to serve great cakes all the time. 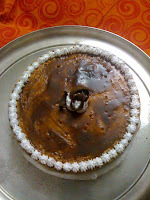 First I have prepared a very small cake with the ingredients shown in the receipe, just to check whether it will be OK as I had to give it to my friend's birthday (Operator in my college). When it was ok, I prepared the same cake with double quantity and decorated. I am sending a picture of the same and also the cakes prepared earlier. I really don't believe each of them who tried a very small piece praised me like anything. Even one of my friend has told me to teach her. Some of them thought it was purchased from monginis and were turning around the cake box up and down to find the missing stamp of monginis. One of the senior most person to whom we had fooled that it was from outside, was confused because he said I don't like cake from outside but this seems very tasty. Sending some of the pictures and also the pineapple cake photo. Thanks for the wonderful and awesome receipe. I had attend two classes of eggless cakes earlier but failed. Hence I was not at all confident. But after the praises from a small kid to senior citizens, I have now become overconfident. Only I am ale to get through the rose petals. I don't remember which colour you had used. While adding and trying different colours, my cream had become very lose and could not hold the petals. Hence only the roses have been failed. I was confused with rasberry and orange red colour, mixed both and the final colour you will see in the picture. 3 Large Mangoes, skinned and chopped. 1.Place layers of the above fruit in a serving bowl. Set aside while you prepare the topping. 2.Hang the curds. Beat cream until thick. 3.Add the curds / yoghurt and combine well. 4. Pour this mixture over the fruit. 5. Sprinkle with a thick layer of soft brown sugar. 6. Refrigerate for 2-3 hrs so the sugar can form a crust. You can replace the mangoes & grapes wit any other fresh fruits of your choice. All new recipes will b posted first so that you will view the latest recipe first. 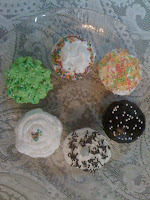 Please leave your comments on the recipes as well as the new look of the blog. Looking forward to your suggestions and feedback --so as to improve your experience on the blog. Hope the recipes add flavor to your day. Finally got the time to pen the much deserved but long delayed testimonial. The workshops are really addictive. The worshops have now become integral part of my weekend schedule. Am eagerly waiting for chinese. Just wanted to thank you for all the wonderful recipes you have taught me-- no one at home can believe that i have made the food at home and not ordered it out form somewhere. Thanks for sharing all the tips and knowledge--- never have found someone who is so willing to help and share her knowledge---Something i have not come across in any other class-- ur willingness to help even after the class ---be it by phone or email and of course your prompt replies to all the queries. Though I will not be able to attend more of your classes as am moving out-- but will surely miss them and hope to catch them when ever i am back. The summer is here so thought will post some mock tails recipes to keep you all cool. do try them and send in your feed backs. New recipes are posted on the recipe page so check it out and enjoy. Its that time of year again when I take my break from classes and head to North India for my well awaited break. The time when I think of new recipes-- so that i can have all my students coming back for more. Do watch this space for some recipes and great cooking ideas. So till Season 3 ----which begins on May 15th--- here is to all my students and followers A Very Happy Holiday---I am still a phone call away or an email away for all your queries--- so keep cooking those great dishes till we meet again. 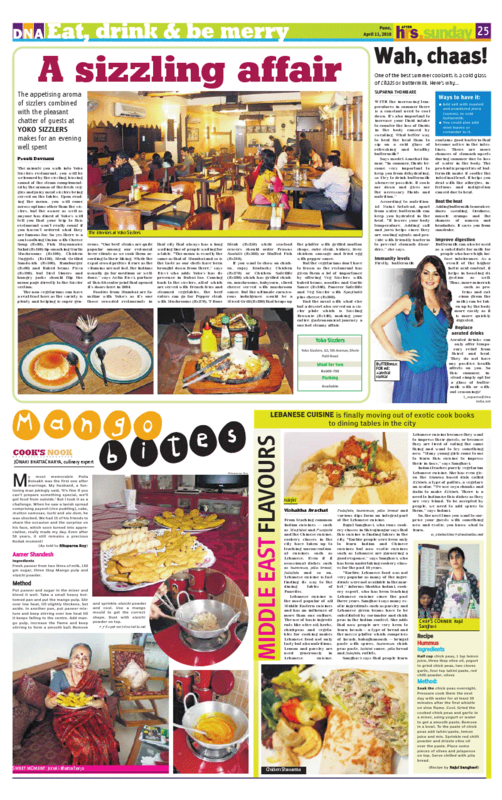 feedbacks for Chaats n the mughlai class!.. Chaats!.. wat a class!.. 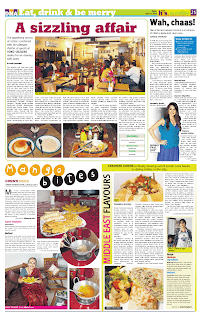 yummy..... aloo chaat was mind blowing... uuuummmmmmm!.... n the dahi bhalla chaaat!.. katori chaat!.. yum!.. especially the left overs were a super hit in my house!.. now i know if kuch chatpata khaana hai to chutneys tayyar rakho!.. even ur happy n so is the family!.. mughlai... See More!.. this class is a super blessing in disguise!.. expecially coz i cud never make an interesting vegetabe which went in the tiffin n i cud wait for a call at 1 saying awesome!.. but this really made me get it!.. n the best part the vegetables taste just like the restaurants.. n there is not water flowing out of the curies when put on the plate!.. n there is no oil floating over the vegetables!.. thank u so much.. ur recipes are a super blessing in disguise!.. i wont b surprised a year from now my family wud say lets eat at home than going to a restaurant!.. thank you.. im saving my money!.. n making it healthy n yummy!!!!!! Thanks Rajul . l simply loved the THAI class. Managed to make the Tom Yum Soup a couple of times and so also Pad thai noodles. turned out real good. Mix all the ingredients and add enough milk to get a thin smooth batter, without any lumps. Check the desired sweetness. Heat a lightly oiled non stick pan, pour 2 ladles (appox 4 tbsp.) of above batter and spread out into a thin layer. Pour a tsp of oil around the crepe. cook till bottom browns slightly, Loosen with a spatula, turn and cook the other side. 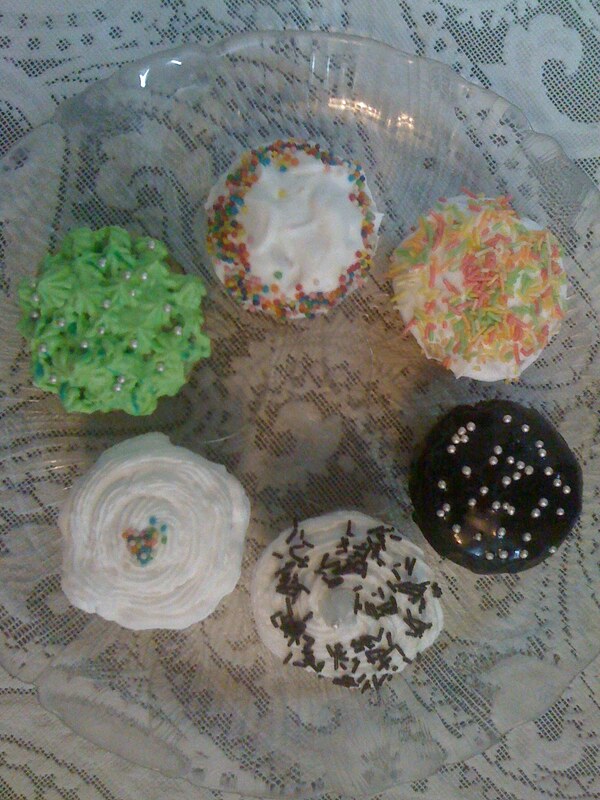 Samika says----- i loved them ---- just loved them--- mummy it was yummy !!!!!!!!!! The class will be closed for 2 weeks and I sure do hope to start the session from 13th March. Do keep checking the blog for some new recipes-- which i hope to post in the free time I get. In the meantime do send in requests, for the class you would like me to schedule in the Month of March. All those waiting for the Ice cream class --- will finally see it as nothing better than ice cream in this month. Wishing You all a very Happy Holi--- may the colors brighten your life and Happy Cooking. 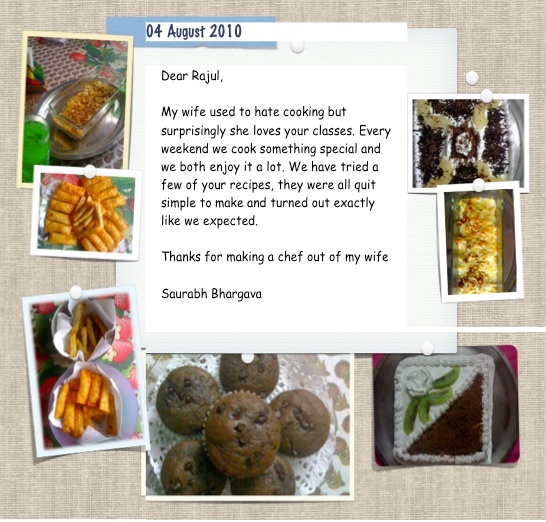 Do write in your cooking experiences to and don't forget to share your favorite recipes. Mix well together until resembles a crumbly texture. Grease a pie dish... and add 3/4 of the mixture press into pie dish then add teaspoons of apricot jam here and there. Mix well. cook till dry. Bake in oven at 180 for approx 30 mins or until golden brown. On a plate spread a layer of corn chips, on them put re fried beans, on it put salsa sauce. Mix jalapenos and shredded lettuce and put on top of salsa sauce. Lastly add a dollop of mayonnaise or sprinkle some grated cheese on it. Add some spice sprinkle some chili flakes. Had a lovely party last night.. the paneer roll ups and the pasta spinach rwraps turned out awesome!.. the mushroom flavour jus stood out..the mocktail was a super hit!>.. PEACH SATIN!.. VOILA!.. U make me feel so confident when it comes to cooking.. plus like cooking!.. feel so bad i missed the italian class.. wanna make sure im there for the mexican class.. I have attended a few classes of yours. It was a wonderful experience. Everybody in my family loved the recipes. Now I am waiting for your Chinese class, this time when you schedule it please keep it on a Saturday so that I can attend. Awesome workshop.. everything was so yummy.. fabulous.. n best part easy to make!.. the indonesian potatoes was a major hit.. n the spich wrap tres bien... n the dessert made out of the corn horns.. the new dip and the stir fry.,... tooo good!.. ur classes jus rock!.. its like there is so much more u wanna do in the kitchen now!..